I'll Be There for You (Theme from "Friends") arranged by Pete Schmutte. Choir Secular. SATB choir. Choral Octavo. Alfred Archive Edition. Secular; TV. Grade 3. Choral Octavo. 12 pages. 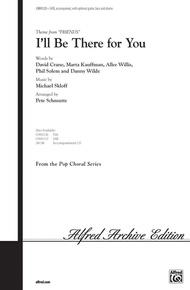 Published by Alfred Music (AP.CH95125).The hit song from the monster hit television series 'Friends.' The success of the weekly series continues, and you can hardly turn on a radio without hearing The Rembrandts hit recording of this infectious theme. Sure to be a favorite with choirs and audiences alike!Recorded Acc. Available.